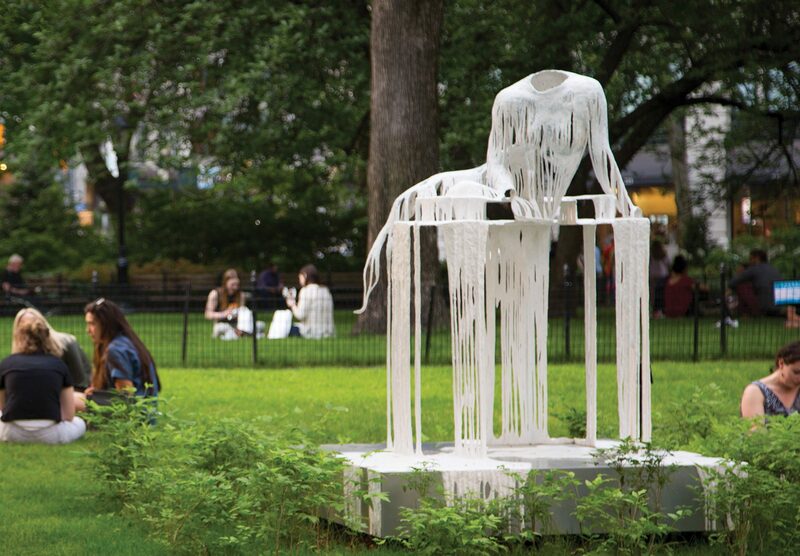 Diana Al-Hadid (American, b. Aleppo, Syria 1981), gives a talk on "Delirious Matter", four public art sculptures temporarily installed on the Williams campus. Diana Al-Hadid was born in Aleppo, Syria in 1981 and currently lives and works in Brooklyn, New York. She received a BFA in Sculpture and a BA in Art History from Kent State University in 2003, and an MFA in Sculpture from Virginia Commonwealth University, Richmond in 2005. She also attended the Skowhegan School of Painting and Sculpture in 2007. She has been the recipient of a Joan Mitchell Grant, a Louis Comfort Tiffany Grant, a New York Foundation for the Arts Grant, and a Pollock-Krasner Grant. She is also a United States Artists Rockefeller Fellow. Al-Hadid has had solo exhibitions at the David Winton Bell Gallery at Brown University, Providence, RI, NYU Abu Dhabi University Gallery, Abu Dhabi, UAE, The Vienna Secession in Vienna, Austria, the Columbus College of Art and Design, Columbus, OH, the Akron Museum of Art, Akron, OH, the Savannah College of Art and Design, Savannah, GA, the Weatherspoon Museum of Art, Greensboro, NC the Virginia Museum of Fine Arts, Richmond, VA, the University of Texas at Austin, Austin, TX, the Nasher Sculpture Center, Dallas, TX, the Centro de Arte Contemporánea, La Conservera, Murcia, Spain, the Nevada Museum of Art, Reno, NV, and the Hammer Museum, Los Angeles, CA. Her work is included in collections such as the DeCordova Museum and Sculpture Park, Lincoln, MA, the Whitney Museum of American Art, New York, NY, the Virginia Museum of Fine Arts, Richmond, VA, the Museum of Fine Arts, Houston, TX, and the Weatherspoon Art Museum, Greensboro, NC. She is represented in New York by Marianne Boesky Gallery. Diana Al-Hadid, Synonym, 2017–2018. Polymer modified gypsum, fiberglass, powder-coated aluminum, and pigment.